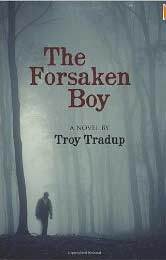 Of all the creatures that go bump in the night, I have always been partial to werewolves, so it may not be surprising that I rather liked Troy Tradup's The Forsaken Boy. However, this is not just a great lycanthropic story, but a great book of any kind. Brandon is a senior in high school, a victim of bullying for much of his life, both physical and mental. An outsider, he has only one real friend. When his Ojibwa mother died, he was taken off the reservation to live with his forgotten father, a cruel man who resented the intrusion. A coward, Brandon cannot step up to confront his many tormentors, and he leads a pretty miserable life. When circumstances change which gives him the ability to not only confront his tormentors but do something about it, he has to also confront the evil inside of him. Many werewolf tales have a bit of the Jekyll and Hyde in them, exploring how in a single person, there can be both good and evil. In this The Forsaken Boy has some of the same themes as explored elsewhere. The fact that the protagonist is an angst-ridden boy does offer some new avenues to explore this, but what makes this book transcend most others is the author's writing style and skill. First, the story flows easily and without hiccups and pauses. This enables the reader to be drawn in, to become part of the story. Characterization, both of people and the Minnesota north woods community is simply outstanding. Many authors do a good job of characterization of the main players in a book. But Tradup goes beyond that. In one scene, he takes a very minor character, Millie, a postal worker, and really develops an interesting and complex person. Given the plot action Millie provided, too many authors would have made her a throw-away character, shallow and one-dimensional. But Tradup develops her into someone I really wanted to get to know. Her little secret became my little secret. In the same scene he describes the "summer" people, people who leave the cities and come out to the woods, people who build their summer palaces, who bring all the trappings of civilization to change their bit of the wild into their city environments, then complain that there are no more wild places. When reading this section, I actually had to slow down to savor the wordsmithing, to taste the banquet being offered. Tradup's writing is rather emotive. This is not a shallow read. This a story which grabs the reader and won't let go. I finished the book at 3:00 AM even though I had a flight to catch at 6. I kept promising myself that I would read "only one more chapter." I failed in that. The tale is filled with death and destruction, but most of that is implied rather than shown. Very little violence is explicitly described. This and the fact that there is some implied child abuse may make the book not suitable for very young readers; however, there is more explicit violence in many comic books. The Forsaken Boy is certainly my favorite novel of the horror/supernatural genre, and it is one of my favorites of any genre. I cannot recommend this book enough. For more reviews or to buy The Forsaken Boy from Amazon.com, click here.